I have to give back the Chevy Equinox I've been driving for 2 weeks. Not to mention, I've been driving the same Mitsubishi Endeavor for 6 years now. And there is quite the collection of old french fries and cheese puffs in there. hahaha. Gross, right? Anyway, I was invited to test drive the Chevy Equinox with my family to the celebrate Chevy event at Hershey Park in tasty Hershey, Pa.
We loaded up the car to spent two nights in Hershey learning more about Chevy. I have to admit, although I do currently own a foreign car....I love to support American made goods. And lets be honest....there isn't much better than a good old fashioned Chevrolet for American pride! 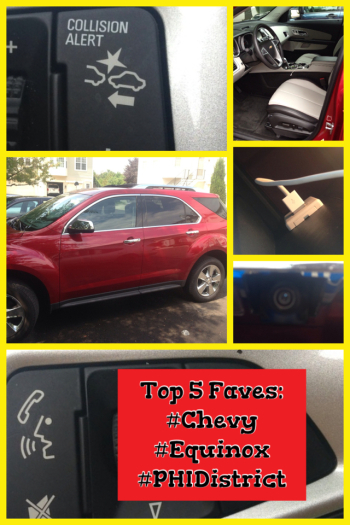 While driving this fab crossover vehicle - I found 5 things that are totally awesome that I want to share with you. 1) BLUETOOTH. I know. The fact that I don't have a bluetooth automobile is embarrassing. Really sad. But truth be told - my car is a 2004. It is PAID FOR too. But having one for a week has made me REALLY want a vehicle that has a built in bluetooth. If not for convenience-than for safety!! 2) COLLISION ALERT. Otherwise known as 'honey-you're obviously driving too close to that car!!!' alert. Yes. That's really what it does. It was great because I bumped it wayyyyy up. ahem. To be funny. And it went off the ENTIRE TIME we traveled to Hershey when my husband drove. FUNNY FUNNY to see my husbands face when I busted him out. hahaha But in reality-it's an amazing addition to the Chevy family. When you do traffic travel often-it really keeps you on your toes. 3) USB PLUG-IN. I have a fabulous phone that needs a fabulous charger. So, to be able to plug my iphone in via the cord it came with (and not have to buy a specific car charger) is GOLDEN!! Makes me soooo happy that I can listen to my tunes too. And... Hudson has a set of songs that helps him relax. It works. It ROCKS that I can play it into the car and not have to put my cell up to his ear!!! 4) REAR CAMERA. Driving an SUV you know that sometimes its hard to see what (and who) is behind you. My neighborhood is INSANE with young kids riding bikes, running, playing...you know. Being KIDS. So to see via a camera out the back of my car when put in reverse? COMFORTING. For fun, I got to try out a Chevy Comaro Convertible at Hershey Park. It was a test drive that ROCKED. *DISCLOSURE: I was given an Equinox to test drive for a week. My famiy and I did get to stay at a hotel provided by Chevy & tickets to Hershey Park. But that doesn't change my experience. Thanks Chevy!